I bought a Groupon for Cafe Press several months ago. And then I promptly forgot all about it until it was due to expire, at which point I'd lose the money. With no projects in mind and no time to design anything, I slapped the pattern from the argyle printable business cards on a couple mugs. They arrived yesterday. I am concerned that Alex and I will fight over the orange one. Those turned out really adorable -- I'm glad everything worked out. Those Groupon expiration dates can be sneaky! I would fight over the orange one too! Very cute! Precious. 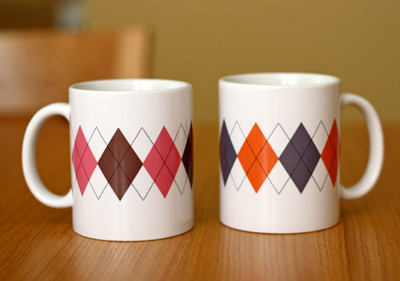 I need one to match the many argyle items in my wardrobe! LOVE!! I REALLY want that orange one. they match aaron and my socks!! which we love, by the way. Love. I'd fight over either of 'em! They are too adorable, I want some!!! I've been searching forever for new mugs and haven't found any that I like. Do you know why I love your blog? You have simple, yet awesome posts that are straight and to the point. No long drawn out posts to read. You have sweet ideas and pure eye candy!! If I'm weeks behind in reading your blog, it doesn't take me hours to catch up. You just don't see the words "emergency" and "argyle" in the same sentence very often. Ha ha! They turned out super cute for a last minute design! Love the mugs and the business cards! Your mugs are driving me batty! Please please let us buy them! What happens if my Groupon expires? All is not lost! Once a Groupon reaches its expiration date, it loses its promotional value, but you can still redeem it at the price you paid for the length of time stated by gift certificate laws in your state. Just another reason Groupon ROCKS! Oh! I didn't know that! Thanks for the info. I loooooove them! What a great idea! Just pretend that the pink and brown one is the coolest. And that when he uses it, you are really disappointed because it is definitely the best one. Trust me on this one!